A drought has settled in the area around the orphanage where Boniface lives. There are long line-ups at the tiny spring where all the local people get their water, and suddenly the orphans are pushed to the back of the line, unwelcome. Boniface's houseparent, Henry, tells him that the people were mean out of fear--they feared there would not be enough water for their families. When the building of the orphanage's well is completed, Boniface has an idea to help the villagers. A lovely story of kindness and heart, this story shows that, through compassion and understanding, true generosity can spring from unexpected places. This is a heart-warming story of kindness, generosity, resilience and brotherhood in the context of scarce resources, poverty and the other everyday struggles of people in Mbooni. Boniface, the protector, is caring, thoughtful and compassionate. He teaches the reader that it is always our responsibility to make the world a better place especially when we have the resources to do so. In the author’s note, there are photos of the real Boniface and his siblings. Walters explains that Hope Springs is based on an incident that really occurred when children from the orphanage sought water during a drought. Creating a story based on a real event makes the narrative compelling and authentic. 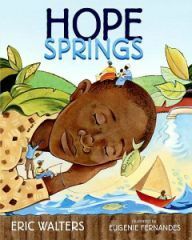 Hope Springs is illustrated by Eugenie Fernandes who illustrated My Name is Blessing (2013) also by Walters and also set in Kenya. Her colorful pictures are lively and energetic. Although she paints a picture of a poverty-stricken people–the typical stereotype about Africa–she manages to show poverty without stereotyping the people. My only quibble is the book’s typeface is small in contrast to Fernandes’ bold illustrations. A larger text would be easier on the eye of the reader. I highly recommend this book to all. There are universal lessons and truths about sharing and caring with those around us who have limited resources, are going through the scarcity of basic needs, or need our lending hand. The primary message is an old one, we are our brother’s keeper.